The next-door neighbor… [Sanders’] neighbor on Capitol Hill called the Washington Post and told the Washington Post that they were cancelling their Washington Post subscription because their very expensive Sunday Post stopped showing up. Not there this week, last week, the week before, then it was there one week but the week before it wasn’t delivered, so I’m cancelling my subscription to the post because your delivery person never gets to me. I’m paying for it but it never gets to me. WaPo investigated. Turns out a guy matching the description of Bernie Sanders had been running out to grab the paper as soon as it was delivered. He must have reasoned that since his neighbor had a paper and he did not have a paper, that gave him a right to take the paper, in accordance with redistributionist principles. Sanders was kicked out of a hippy commune for being too lazy. During the height of the Cold War, as Mayor of Burlington, he had a Soviet flag on his wall. 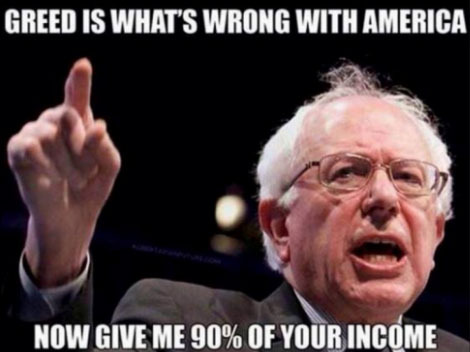 The guy is a true socialist. In return, socialism has been very very good to him. Genuinely believes in his thieving, parasitical ideology.